The 1968 National Horse Show was in full swing, and spectators filled the stands of Madison Square Garden in New York City, gathered together to watch some of the world’s best riders make a run for the wall. The puissance class featured legends like Ben O’Meara and Kathy Kusner. Riding alongside them was 21-year-old Betsy Gerson Densen and her Thoroughbred Gang War. By the end of the class, the wall was 7′, and only three riders remained. Densen and Gang War had the fence down, as did Jared Brinsmade on Sam Lehrman’s Triple Crown, while Emanuel Mittman’s Toy Soldier rattled the wall but kept it up. Toy Soldier won the day, and Densen and Brinsmade flipped a coin for second. “We laughed a lot deciding that we weren’t going to jump anymore,” Densen said. A.C. Randolph bred Gang War in the late 1950s and sent him to Rodney Jenkins for training. 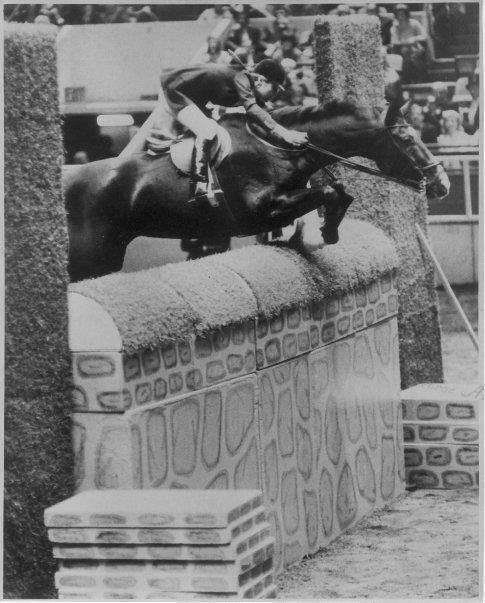 The 16.1-hand gelding did well with Jenkins, often winning tricolors in the green jumper division. Gerson made the purchase, and Densen stayed in the game to ride him, “as an 18-year-old would do,” she said. She praised the horse’s consistency, which gave her the courage to enter the puissance class in the first place. “[He] never refused. Never,” she said. But there was the one time he broke her arm. Densen never knew exactly what happened, but she had a hunch. “The best story we ever got was [someone] had taken him out of the stall in the middle of the night, galloped him around and jumped some jumps, and pretty much scared the crap out of him,” she said. “Then they put him back in the stall all sweaty. That’s how we found him. The man had been a groom for multiple trainers. “He was one of those guys who bounced around,” said Densen. It took Gang War only a day to recover his mind; the next morning he was fine under tack with Jenkins. As for Densen, she had to wait to return to the show ring until her broken arm healed. But by the fall of that year, they were fit to jump the highest jump of their lives. The lifestyle was thrilling, but it had run its course. “I suddenly realized that there were other things in life,” Densen said. By the early 1970s, she opted out of horse show life entirely. She married Peter Densen, moved to Tenafly, New Jersey, and had two children, Matthew and David Densen. Her sons gave her five grandchildren—Katie, Elizabeth, Olivia, Evelyn and Leo—but none have shown interest in riding.